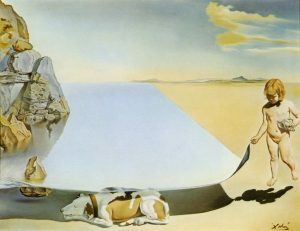 Salvador Dali was influenced by…EVERYTHING! A random shadow cast by tree limbs gave rise to inspiration. A commercial image on brand name packaging triggered a vision. 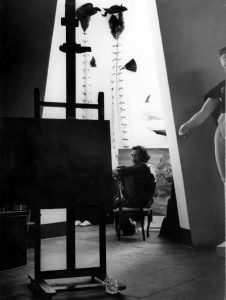 But there were also certain long-standing interests Dali cultivated that drew him in and shaped the ideas for his next masterpiece. Such was the case in his seldom considered but quite fascinating “Rhinocerotic Disintegration of Illisus of Phidias” (1954). In this case, a classic Greek sculpture of Illisus, the river god – from the Parthenon in Athens – proved an ideal body of water for Dali to navigate. Greek mythology was one of numerous interests Dali passionately pursued throughout his career, accounting for many of the prevailing themes, as well as smaller elements in his paintings, prints, drawings and sculpture. Painted at the height of Dali’s Nuclear-Mystical period, “Rhinocerotic Disintegration” is a textbook example of how Dali melded classical themes with contemporary interests – in this case his fascination with nuclear physics and the discontinuity of matter. These were things science was revealing at the time, and Dali reflected these discoveries in the “atomic” manner in which he was now depicting ordinary objects. 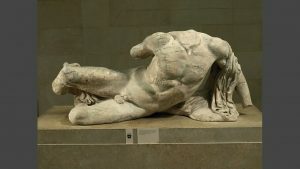 The “ordinary object” here is Phidias’s marble statue (see photo of actual sculpture) – reimagined through a Nuclear-Mystical lens. What an exciting example of the “Dali difference,” to which I’ve been referring in my blog posts, exclusively for The Salvador Dali Society, Inc.
Dali shows us what an ultra-solid object like a marble statue essentially looks like at the sub-atomic level: a phenomenon where protons and electrons of unimaginable minuteness reveal a world where particles of matter do not touch; everything is “rumping and jumping about!” to quote Dali’s amusing explanation. The chest of Illisus is transparent, and the cube within it is a nod to geometric principles devised by the ancient Greeks. Meanwhile, his legs and left arm are dematerialized in a riot of atomic-like particles, many in the shape of rhino horns, whose naturally occurring logarithmic curve captivated Dali to pretty much an obsessive degree. 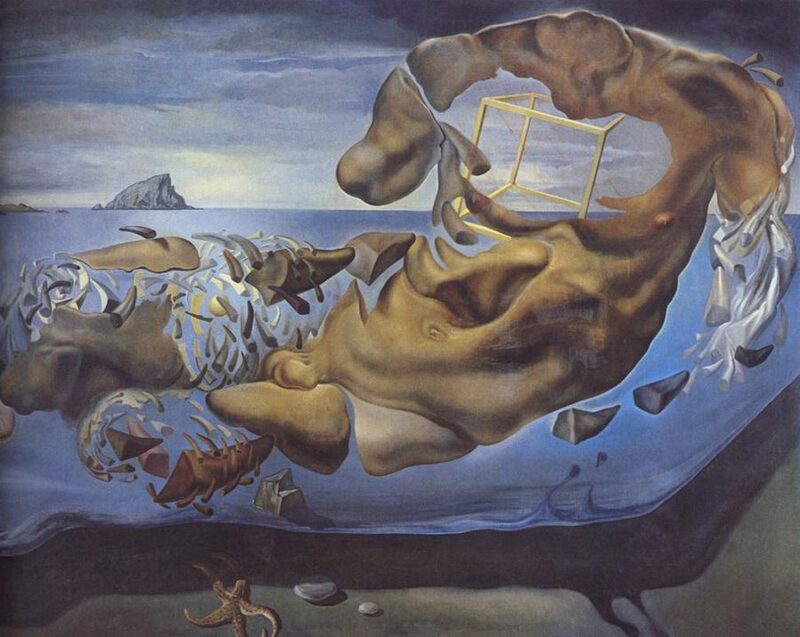 Even the sea above which the river god reclines is detached from the earth, further emblematic of the nuclear view Salvador Dali was taking of the world at this point in his prodigious career. Meanwhile, the starfish and sea urchin shell, together with the distant terrain, inexorably link the painting to the influences of Dali’s Spanish homeland. I think it was Dali patron Reynolds Morse who coined the term “Dalinian Continuity,” whereby Dali linked his various morsels of Surrealism by intentionally repeating certain concepts and images. How satisfying it must have been to Dali, being able to pay homage to the Greek artists and gods he revered, while holding up a mirror to the modern world in which he became his era’s greatest artist.